South Asian Games gold medalist Vinoj Suranjaya (Mercantile Athletic Federation) broke a 20-year-old record and also established a new Sri Lanka record in the 200 metres events on the opening day of the Senior athletic trials held at the newly laid Sugathadasa Stadium yesterday. Suranjaya clocked 20.68 seconds to erase the previous record of 20.69 seconds set by Sugath Thilakaratne at the Asian Games in Bangkok 2008. Anitha Jagatheshwaran winning the women’s Pole Vault. He also qualified for the Asian Games later this year by finishing well within the qualifying standard of 21.70 seconds. Suranjaya is coached by former Sri Lanka boxer and current boxing and athletic coach Vimukthi de Soyza. Himasha Eshan representing Sri Lanka Army finished second to Suranjaya in the 200 metres clocking 21.24 secs. Another senior athlete Dilip Ruwan came third with a time of 21.37 secs. Eshan is also the holder of the 100 metres national record and South Asian record with 10.26 seconds. 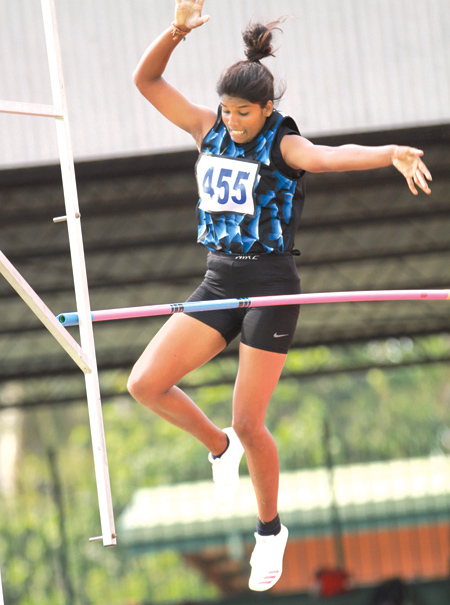 Jaffna’s vaulting queen Anitha Jagatheshwaran who shone in the junior athletic championships concluded on Thursday with a new Sri Lanka mark of 3.55 metres failed in her attempt at the senior trials when she managed to clear only 3.30 metres in the women’s Pole Vault. Her poor performance was due to a shoe cut injury. She however won the event ahead of KLSK Perera (3.10m) and Herina Chanthirakumar (3.10m) who finished second and third respectively. This two-day trial will be used to select athletes for the forthcoming Asian Games 2018 in Indonesia this year.